A delicious accompanyment to many dishes. It’s great with fish or anything that’s been slow cooked in the tagine. Also great alongside BBQ stuff. 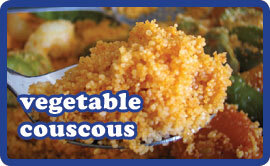 Put the couscous into a bowl and cover with 1 cup of hot water. Cover and leave for 10 minutes until all the water is absorbed. Break up with a fork and leave to completely cool. Meanwhile chop all the vegetables and when the couscous is ready, combine all the other ingredients well. Cover and leave for at least an hour at room temperature for the flavours to develop.